Applied Communication Research Methods: Getting Started as a Researcher demonstrates how to apply concepts to research problems, issues, projects, and questions that communication practitioners face every day. Recognizing that students engage more directly with research methods when they experience research through hands-on practice, authors Michael Boyle and Mike Schmierbach developed this text to demonstrate the relevance of research in professional roles and communication careers. 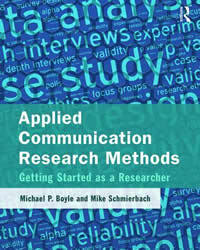 Online resources, including sample syllabi, test banks, and more, are available on the companion website: www.routledge.com/cw/boyle.Applied Communication Research Methods is a concise, engaging work that today’s students and industry practitioners will embrace and keep on-hand throughout their careers.